1. Melt together 12 oz butter and bittersweet chocolate. Set aside. 2. 2. Mix 4 oz. butter and 7 oz. sugar until fluffy. 3. Add eggs and egg yolks one by one, mixing about 30 seconds between each. 4. Add melted butter and chocolate (needs to be just lukewarm). 5. Add Grand Marnier and orange zest. 6. Sift together flour, cocoa powder, salt and baking powder. 7. Add dry ingredients into the butter egg mixture and mix for 3 minutes on high speed. 8. Make meringue with egg whites and remaining 2 oz. sugar. 9. 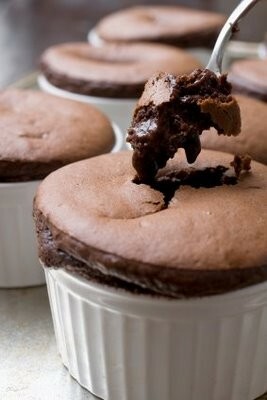 Fold meringue into the chocolate mixture. 11. Butter 8 (6-ounce) souffle dishes or custard cups. 13. Bake in preheated oven until cakes are firm around edges but a nickel-sized area in center still moves slightly when shaken, about 9 to 12 minutes. Whip heavy cream together with sugar. Add in Grand Marnier.